Whether you are a power player, shot shaper, or short knocker — If you’re looking for a driver that finds the sweet spot among accuracy, impact, versatility, and a lot of driving forgiveness, then keep reading. We cover a few of the latest drivers on the market and share the details and features of the top fan-favorite manufacturers. Big Bertha Alpha 815 brings in the latest “gravity core” technology allowing golfers to easily adjust (raise/lower) the center of gravity (CG) to change the launch and spin of the ball. It’s a yardage guzzler, eating up distance like a bullet rushing through the air. Even the miss-hits seem to hold to their line and offer generous distance. The Big Bertha Alpha 815 manages to combine the adjustability of the original Big Bertha Alpha and the forgiveness of the standard Big Bertha from last year. As a result, the Alpha 815 keeps the ball in the park, making it one of the most accurate drivers in the market. Lightweight and lively, it offers excellent balance and stability and delivers a punch at impact. 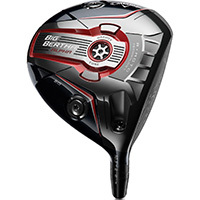 With interchangeable weights and the adjustable CG, the big Bertha offers adjustable trajectory and spin and even can help a golfer draw or fade the ball. While it offers great game improvements, the CG adjustments and driver tuning can prove troublesome unless you really know what you are doing, so make sure a fitter gets you set up properly. 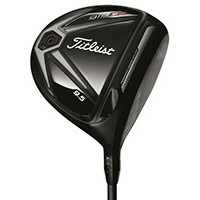 The 915 D2 Driver is the most user friendly driver from Titleist to date. It offers versatility and variety for lower-handicappers, while packing enough oomph (and forgiveness) to excite aspiring players. At address, the deep head (devoid of distractions and gimmick), offers an exceptional footprint (for a Titleist) and ensures that the purist is living his/her dream. Sturdy and metallic, the 915 D2 boasts a high speed face insert — a radially thin perimeter at the toe and heel with a thicker center. Hence, it is able to deliver greater distances by actively flexing at impact — reducing spin and slinging the ball at higher speeds. The lowered CG preserves forgiveness and adds ball speed with the characteristic Titleist crack and exceptional feel at impact. The accuracy and level of forgiveness are simple and straight — letting shots travel like they’re set on a track, while ensuring mis-hits still find the fairway with adequate distance. Added to all that, it is one of the longest drivers on the market with a balanced mix of roll and carry. Combusting air for less power, the AeroBurner is created especially for the light swingers in need of an altitude adjustment. Weighing less than 300 grams, it is one of the lightest drivers in its class. A consistent high-launching driver, it offers serious hang time. Furthermore, it is one of the mightiest forgivers on the shelf, recovering solid yardage on off-center hits, and turning hooks in to draws and slices into fades, almost all on its own. 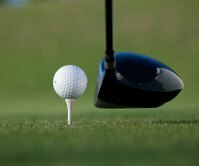 It lacks the adjustability found in other drivers, but nonetheless, most golfers will find the shots stay pretty straight. 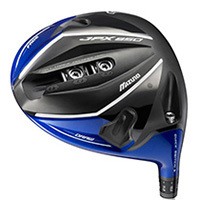 It is not meant for powerful swingers (plus 100 mph), as it is a high-launching driver that tends to impart a fair amount of spin – two characteristics that, when added to the lightweight construction, improve distance for the bulk of amateurs who swing below the 100 mph mark. All that adds up to a great driver that provides a lot of help in gaining needed distance while offering exceptional forgiveness. If you have a low to medium swing speed and want to keep the ball in the fairway while punching it out there farther — then the AeroBurner is a top pick for you. 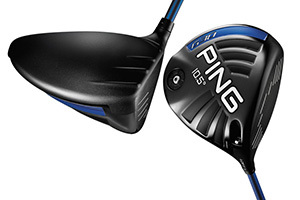 Softer, longer, and stronger, the Ping G30 is the all-around monster boasting greater distances and chart-topping forgiveness. Sponsoring a gothic tinged matte finish and claw-like fins, it sports an aggressive look —like something straight out of the Bat Cave. The fins along the crown of the club act to promote the aerodynamics of the driver, increasing clubhead speed by a few miles per hour which, in turn, result in yards added to a typical drive. Long and lenient, assuring relatively low spin, and with a mid-launch head, the G30 is a fairway finder. It will effectively cover any and all flawed and lazy swings as long as the shot is hit with the face. Compared to the fan-favorite G25, the G30 offers greater speed and lower spin — equaling greater boost through impact. Thanks to the high-balance-point shaft, the driver is easier to swing and offers a resounding, bright and metallic bang at impact. Consequently, the mid-to-high ball flight leaves no trace of ballooning and makes for some booming hang times over trouble and onto the fairways. 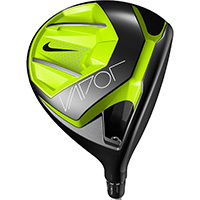 Delivering a sensational (albeit muted) baseball thwack at impact, with plenty of information reaching the hands, the Nike Vapor Pro is one of the best drivers for cutting down on your spin. Sporting the typical flashy Nike looks, Vapor Pro retains a classic pear-shaped head allowing the the clubface to sit square and aim easily. It also boasts an adjustable hosel — comparable to previous Nike drivers – allowing changes through five lofts (from 8.5° to 12.5°) and three different face angles (neutral to 1.5° left or right). The Vapor Pro targets golfers on the higher end of golfing skills, reducing spin for higher swing speeds. Average players and light swingers will find it demanding as the shots will stay down unless you build the needed oomph in the swing. That leads to a laser-like trajectory, drilling a wormhole through space, taking the ball a long way and with serious legs after landing. Delivering great playability, the Vapor Pro does not cause ballooning and offers a ton of roll with pleasantly surprising versatility for the head size. Then again, it requires more skilled players to work draws and fades with it. Improving and building your game? 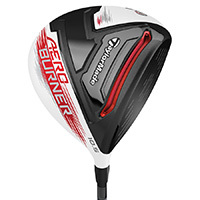 Then you might want to try the Vapor Speed driver. It delivers effortless power, allowing seamless transition to the first tee and surprising distance on miss-hits. Forged in the depths of mount Mizuno for the confident few that prize feel over power at all times, the JPX-850 offers strong across-the-board results, innovative adjustability, and great looks. All combined to grant Mizuno a new direction in the niche. The JPX-850 comes with two 8-gram weights that can be positioned along a sliding track either forward, near the face , or back to the trailing edge of the clubhead. These adjustments allow a golfer to find the right balance between reducing spin (forward position) and increasing the launch angle (rearward). Alternatively, the two weights can be placed in slots near the head and toe to improve overall head stability to promote forgiveness. This innovative design is paired with perhaps the most adjustable hosel in the market, allowing the driver to be set at 7.5 degrees of loft all the way to 11.5 degrees. Paradise Pointe Golf Complex in Smithville is like a golf version of an impeccably run full-service hotel. It has everything and one visit is all it takes to make you want to come back over and over again. The golf is there – twice over – as the complex is the rare public venue that offers two 18-hole layouts. That not only results in double the public tee time opportunities, but makes league and tournament play easier to accommodate. And golf, by the way, is just the start. Paradise Pointe added a 4,000 square-foot banquet room overlooking the course in 2007. The room can seat up to 225 people for weddings, receptions, large parties or public events, such as the annual Eagle Days sponsored by the Missouri Department of Conservation. The banquet room is for meals, drinks, golf talk and awarding prizes after tournaments, of which there are many at Paradise Pointe. Charitable tournaments, corporate events and other organized golf outings can be booked for 16 to 144 players or more. Leagues are also an option for golfers of all ages and abilities. The course has men’s leagues on Mondays and Thursdays and a senior league on Wednesdays. A men’s association and women’s association also have regular playing dates each month. Those two courses are named the Posse, which opened in 1982, and the Outlaw, which came along in 1994. They derived their names from the era of outlaw Jesse James, who roamed the region with his gang in the late 1800s. 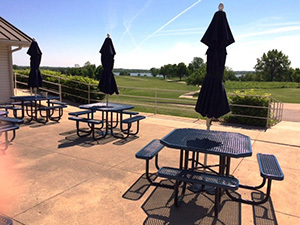 Even people not especially adept at golf, or who don’t even play, would enjoy going to Paradise Pointe to enjoy the panoramic views of Smithville Lake. The blue water, often dotted with sailboats and sport boats and bordered with the natural beauty of woodlands and open meadows, lends a serene feeling. “The condition of our courses is excellent and then you have the added beauty of nature,” Hall said. “You’ll see deer, turkeys, bobcats and some beautiful views.” In fact, it’s not uncommon to hear several tom turkeys gobbling throughout the spring. The course is about 20 minutes north of downtown Kansas City and can be reached more quickly than most people realize, Hall said. It’s much closer than driving to the Lake of the Ozarks, but has that same lakeside resort feeling. 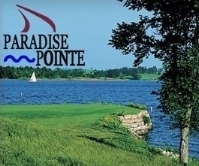 Hall manages Paradise Pointe under a contract with the owner of the course, Missouri’s Clay County. 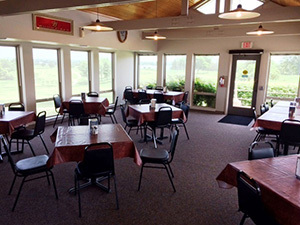 Hall also operates the pro shop, which has a reputation for its selection and quality. Paradise Pointe offers club fitting, lessons, demo days, and golf clinics, including junior clinics held each summer. 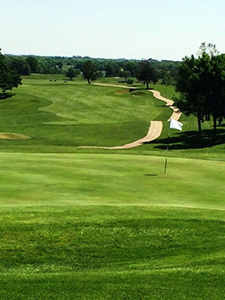 The course is the permanent home of the Missouri Junior Amateur tournament played each July, while also hosting several area high school golf teams for practice and events. As for the courses, the Posse and Outlaw have their similarities and differences. Both have fairways bordered mostly by woods and meadows, with few homes in sight. The terrain is rolling and several holes on each course have lake views, with water at times coming into play. Holes on the Posse are relatively close together, but the Outlaw is links style, more remote, and the 9th hole does not return to the clubhouse. 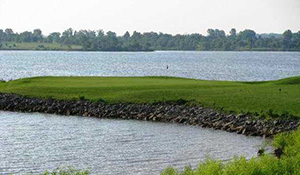 The lake provides a dramatic setting for several holes. On the Posse, the lake juts into the 4th fairway, while the green is placed on a peninsula. The next hole, a par 3, requires a tee shot over the water. On the Outlaw, the lake borders the left side of 9th hole and nearly surrounds the 10th green. The lake runs along the lake on the left of the 11th hole. Posse carries slightly higher course ratings on most of the four tees, including 74.3 from the back tees. Both courses can be walked. The course has a variety of green fees, discounted for seniors and juniors and during certain times of the day. It also offers membership plans for unlimited play, some including carts. Complete information is available on the course website, www.paradisepointegolf.com. The phone number is 816-532-4100. Hall is convinced that anyone who plays at Paradise Pointe will return. “The number one thing is that people are going to have an enjoyable experience when they come out here – from the time they walk up until the time they leave,” Hall said.